Improve your chances at the game with performance enhancing Corsair K55 RGB Gaming Keyboard. 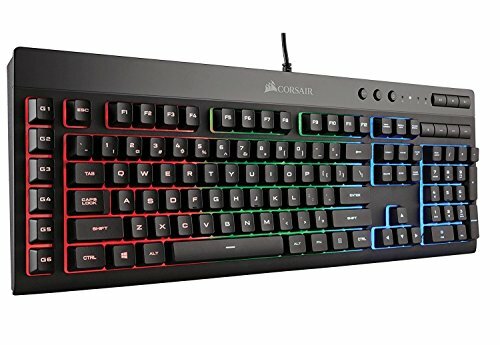 Consider the intuitive RGB backlighting modes, 6 dedicated macro keys, multi-key anti-ghosting and direct access multimedia controls. The keyboard will keep you playing to victorious end thanks to the convenience and comfort of detachable soft rubber wrist rest, keyboard tilt adjustment and windows key lock mode. The 10+ vivid RGB lighting modes allow you to choose between multicolor static backlighting or immersive lighting effects. Designed for the winners, the keyboard is full of helpful features: you're able to adjust your audio without interrupting the game with direct access to volume and media playback. Detachable soft rubber wrist rest adds comfort to support your gameplay during marathon gaming sessions. Quiet and responsive keys ensure minimum noise and satisfying feel without sacrificing performance. Your commands and simultaneous keystrokes register the way you intended, thanks to the multi-key anti-ghosting feature.